All kidding aside, Bertil owns one of the prime cacáo properties in Madagascar. 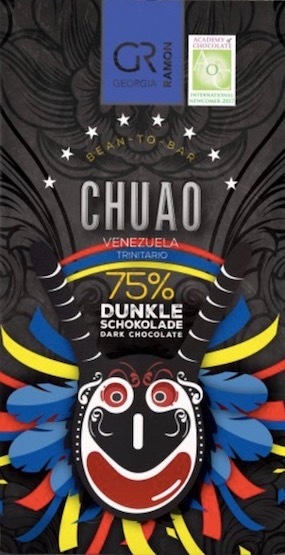 He deals to the chocolate all-stars in Europe & America & is a main driver behind the ubiquity of Mad bars on the market. Chances are anyone who ever shelled out more than $5 for a bar crafted with cocoa sourced from there has probably bitten into the fruit of Bertil's harvest. Between sips & nibs, he effuses 'hey, you ought to try Dandelion's Madagascar. I think they're my favorite now'. Ears prick up while the mind picks up that it sounds a little too facile, & of self-promotion. Further, Dandelion is an American start-up & jumping on them so early violates the C-spot™ 2 kewl 4 skool policy. 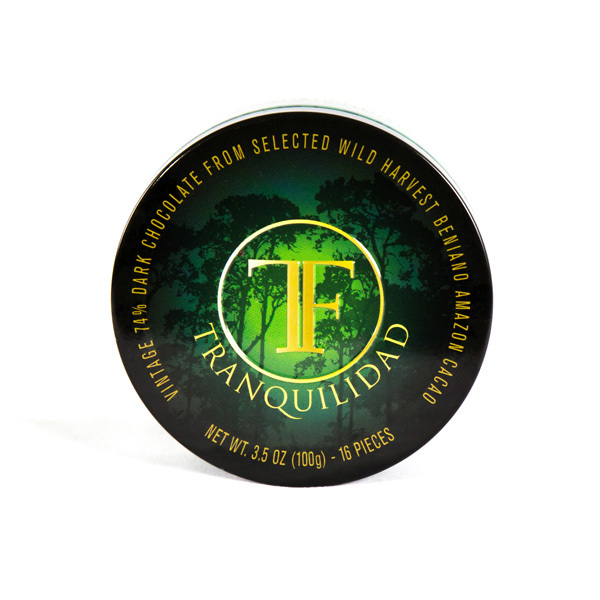 The fact it employs Bertil's seeds however could be an extenuating circumstance in league with rookie Duffy Sheardown crafting greatness with Indio Rojo largely on account of Frank Homann's Xoco Cacáo. Still, oh no, not another Madagascar, third only to Ecuador and Venezuela in populating The Census -- home of the most ratings & reviews on the web, in-depth no less, free of the yummy fodder & filler of bloggers, except the intro to this one of course (how's that for shameless self-promotion?). But when arbiter of good taste & mother-to-be Maricella seconds Bertil's recommendation, well... everybody's been told to listen to mother so the result becomes this review. Dandelion. Yup, these guys roll-out granny's wallpaper wrapping that could be on loan from the Mast Bros & vibe a similarly low-key e-mo. Unassuming millennials dressed in plaid at an early age no doubt, before that became a fashion victim at the Baby Gap™. And like those crossing horizontal & vertical patterns which can still put one in a trance, there's a lot going on in this chocolate to fill the void that is so many bars from Madagascar nowadays which are usually too top-heavy or, conversely, the few that attempt to fabricate a bottom do so at the expense of those upper register notes. Dandelion... just doing the craft chocolate thing that'll be coming soon to SF's hipster Mission District. 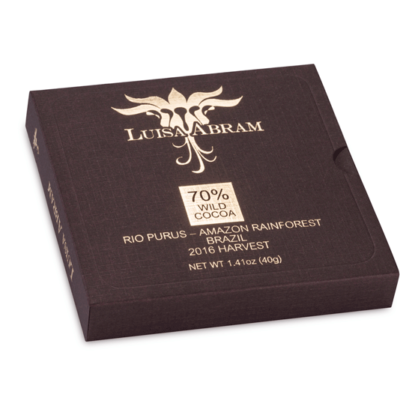 Here's a chocolate that puts it all together in a gestalt bar. Call it 'Plaid-a-Gap™-ster'. 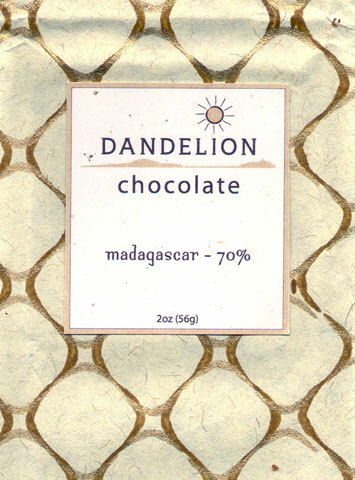 Madagascar, never one to exhibit much core chocolate flavor, nor any big bottom end either, & neither does this, but Dandelion pulls off a sleight-of-hand. A rare dichotomy of highs & lows from this origin that are unified here even as they're sequestered from each other; & even as they cause a bit of flavor-friction that almost verges on colliding. In the main, however, the upper register & the undercurrents happily move in opposing directions. Moreover, the accents are well-defined if not pronounced. A near-clarity of Patric's Mad 70 (with respect to the esters) combined with the base of Domori's Madagared (specifically the caramel tone). All that sugared caramelization points to long in the conche, virtually cooked in it, though the Dandelion crew profess temperatures of only 118ºF - 120ºF. Those may be surface temps. At contact where the teeth in the machinery bite the particulates, it must climb significantly higher because that caramel bubbles up to taste practically boiled. Whatever the precise dynamic, Dandelion presents a unique interpretation that positively stands apart from the glut of Madagascans on the market. A start-up & yet these guys are already destructoids... off to destroy the course. And as a post-script, after a few inauspicious seasons, this along with Madécasse 80 signals a return to form for Madagascar & a good harvest from Åkesson.